The average annual public spending per student in Greece is at 3,200 euros, according to a study by KEFiM – Besides taxes, Greek families pay annually an extra 1.5 billion euros from their pocket for the primary and secondary education of their children. The average annual public spending per student in Greece comes to 3,200 euros based on the figures from 2016 as shown by the study “Education: What are Greeks paying for? Calculating Cost per Student in Education in Greece “presented by KEFiM today at a press conference. The study was presented by Tasos Avrantinis, the research coordinator, lawyer and member of the Board of Directors of KEFiM. The findings were commented by George Mavrotas, Member of the River party in the Attica Region and Professor at the National Technical University of Athens, Kostas Dimopoulos, Professor at the Department of Social and Educational Policy of the University of Peloponnese, and Nikos Rompapas, Executive Director of KEFiM. Coordinator of the discussion was journalist Andreas Zamboukas. Total private expenditure for primary and secondary education in Greece (€ 1.5 billion) amounts to 38% of the corresponding public (3.9 billion). The average annual public spending per student (kindergarten to high school) in 2015 is estimated at around 3,200 euros. Greece is just below the EU average in terms of the percentage of spending primary and secondary education to the GDP. 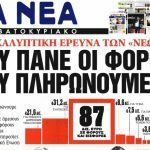 Greek families, in addition to the taxes, paid in 2016 from their own pocket 1.5 billion euros for the primary and secondary education of their children, or 0.85% of GDP. The average annual private expenditure per primary school student (excluding school fees for private schools) in 2016 was 315 euros. The largest portion of this amount is for foreign languages (82%), followed by tutorials and private lessons (12%), and other costs (4%). The average annual private expenditure per middle school or high school student (excluding school fees for private schools) in 2016 was 1,548 euros. This amount is allocated to tutors and private lessons (65%), foreign languages (34%) and other costs (1%). During the discussion about the findings of the study, Nikos Rompapas underlined the importance of access to objective data by both political figures and citizens, a goal that KEFiM contributes to with initiatives such as this study, as well as studies on the Tax Freedom Day and the Economic Freedom Index. Tasos Avrantinis, among other things, stressed the need for valid qualitative and quantitative data to assess the effectiveness of public action and policy design. Particularly in education,as he said, the lack of transparency and evaluation is great, for example, while a committee on education finances has been established, no findings have yet been published. He also stressed that spending on children’s education remains one of the top priorities of Greek families even in the crisis, while referring to the small size of Greek schools compared to other European education systems, and also to the increase in the number of teachers despite the decrease in the number of school units and the number of students. Kostas Dimopoulos referred, among other things, to the proposal included in the study on the reform of public funding for primary and secondary education by introducing algorithms that will take into account the national cost per student and all the necessary related parameters to act as a tool for strengthening the quality and innovation. George Mavrotas stressed that to improve something, one must first measure it. He pointed out that the River will re-submit a Question to the Minister on the findings of the committee on the educational finances and mentioned the need for substantial upgrading of technical and vocational education as well as teacher evaluation not punitive but motivational. He also underlined that Greek families outsource a large part of education to the private sector, meaning after school classes, while he described the proposed funding allocation algorithm as very interesting. Finally, he congratulated KEFiM, stressing that studies such as today are particularly useful in the political decision-making process.